Caille Puck 5-cent upright slot machine with music, pre-1900, stocked with great American tunes, plays well. Estimate: $18,000-$22,000. DENVER, Pa. – Morphy’s Oct. 4-5 Premier Advertising & Coin-Op auction contains more than 1,100 top-quality lots from several major collections. There are dozens of early coin-op, slot, penny arcade and pinball machines in the sale; as well as 60+ lots of superb tobacco tins from the David Hirsch collection, and one of the most comprehensive Moxie collections ever amassed, that of the late Jan Miller Bacci of Boston. The Hirsch collection includes many of the finest known tobacco tins. “All of them are in beautiful condition, and some are believed to be the only ones of their type in existence,” said Dan Morphy, CEO of Morphy Auctions. Lot 8, a Century Tobacco flat pocket tin is estimated at $1,000-$1,500; while Lot 11, a pre-1900 Old Abe Chewing Tobacco flat tin is estimated at $1,200-$1,600. Images of American Indian chiefs adorn Lot 7, a Prairie Flower Chewing Tobacco tin, $1,000-$2,000; and Lot 12, an extremely rare Kipawa Cigar tin, $2,000-$4,000. Perhaps the star of the collection is Lot 13, an Alcazar round cigar tin picturing a world famous racehorse from which the brand took its name. Near mint, it is expected to make $6,000-$8,000. Over 150 lots of soda pop advertising will be available, including many coveted, early pieces promoting Coca-Cola and its little-known offspring – Coca-Cola Chewing Gum. Launched around the turn of the 20th century, Coca-Cola Chewing Gum wasn’t a commercial success for the Atlanta-based company. 1914-1916 Coca-Cola Gum cardboard cutout with Dutch boy image, Estimate: $15,000-$25,000. 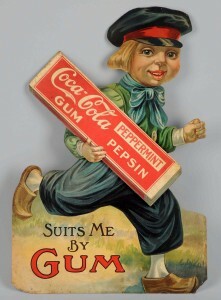 Lot 459, a 1914-1916 cardboard cutout sign depicting a Dutch boy running in his clogs and clutching an oversize pack of Coca-Cola Peppermint Pepsin Gum is another Petretti book example. Vibrant and colorful, the 29 by 22in sign is described in Morphy’s catalog as “important and rare.” It is expected to make $15,000-$25,000 on auction day. Saturday’s session opens with the third offering of occupational shaving mugs from the collection of the late Ray Jones and his wife, Theresa. Ray Jones’ navy career is reflected in many of the mugs he acquired, including Lot 641, shipbuilder, $800-$1,200; Lot 702, deep sea diver, $2,000-$3,000; and Lot 736, USS Philadelphia warship, $1,200-$1,500. Coin-op and arcade machines will follow, with top entries including two prized Caille machines: Lot 795, a pre-1900 Puck 5-cent upright slot, $18,000-$22,000; and Lot 760, a 5-cent Bullfrog upright slot, $25,000-$30,000. The selection also includes many arcade games of skill and 15+ pinballs from the 1950s/60s. A Pace FOK slot machine is actually new/old stock and retains its original shipping crate. The coinage for this machine is the French franc, which is the same size as a US quarter. The machine left Chicago in the late 1930s, bound for Shanghai. It made it as far as Paris, but the outbreak of World War II prevented it from ever making it to China. It is estimated at $7,000-$8,000. Several vintage jukeboxes stand ready to create lively mood music for the auction. Lot 838, a Wurlitzer Model 81 on “Mae West” stand, is estimated at $12,000-$15,000. It will be followed by a Wurlitzer Model 800, $7,000-$9,000. Rare Planter’s point-of-purchase copper and steel peanut roaster topped with papier-mache figure of Mr. Peanut, design introduced in 1920. 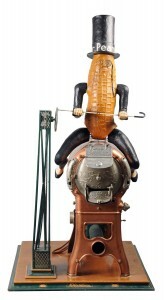 Mr. Peanut will take his turn in the auction spotlight, as well, with Lot 825B, a 1920s peanut roaster topped by a papier-mache figure of the iconic dancing goober, leading the Planters selection. Estimate: $15,000-$20,000. Lot 825A, a fully functional Hamilton stand-on scale, 44½in tall, with a fantastic painted iron figure of Mr. Peanut, could weigh in at $7,000-$10,000. Within the 100+ general store lots are numerous hunting and fishing-related advertising signs. Lot 922, a 1907 Winchester paper-on-linen poster realistically depicts four hunting dogs, $3,500-$5,000. Lot 920, a 1910 cardboard cut-out sign with the image of a shell dog and two quail, could realize $2,500-$4,000. Morphy’s Oct. 4-5 Premier Advertising & Coin-Op Auction will commence at 9 a.m. Eastern Time on both days. All forms of bidding will be available, including live via the Internet through Morphy Live, Artfact and LiveAuctioneers. Morphy Auctions is located at 2000 N. Reading Rd., Denver, PA 17517. Tel. 717-335-3435 or e-mail serena@morphyauctions.com. View the auction catalog online at www.morphyauctions.com, www.artfact.com or www.liveauctioneers.com.